Hi Everyone, Cornish Heritage Farms Rubber Stamps will be teaming up with Faber-Castell Design Memory Craft for a blog hop this week! Good morning. I hope you've been following along this week as the designers at Cornish Heritage Farms are blog hopping with the Faber-Castell Design Memory Craft design team. Using this wonderful Thomas Kinkade stamp - Cobblestone Bridge - I first stamped the image with Clearsnap's Guacomole Chalk Ink on white cardstock. Chalk Ink is the best ink to use to get the details of the Thomas Kinkade stamps to really stand out. I wanted to add color to specific areas of this stamped image and the Faber Castell Gelatos were the perfect coloring agent. I added Lemon and Tangerine from the Yellow Gelatos set around the houses and trees, rubbing the colors in with my fingers. I then added some Blue from the Blue Gelatos under the bridge to complete the image. There are so many different ways to add color to detailed stamps, but I love how the Gelatos allow you to add color so easily and exactly where you want the color! Hi everyone, If you saw my Monday post, you'll notice I used this same CHF Trees Backgrounder stamp. It honestly is one of my favorite stamps. This time, however, I "painted" white cardstock with blue Faber Castell Gelatos and water then stamped the Trees Backgrounder with Clearsnap Candied Yam Ink on top. Since the blue background has different shades due to the amount of water used, I created this wonderful water colored background effect. 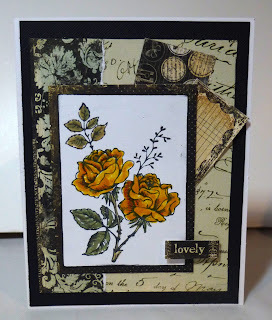 The sentiment is from an amazing set of stamps called Script Essential Expressions. Good morning. I hope you've been following along this wee as the designers at Cornish Heritage Farms are blog hopping with the Faber-Castell Design Memory Craft design team. Today, I decided to do something different. Finding some unfinished wood letters, I decided to use Faber Castell Gelatos as my coloring agent. I first colored the letter with Cotton Candy. Using the included paint brush and some water, I painted the color into the letter. To make the letter darker, I added more Cotton Candy as needed. I then added some Guava to the edges of the letter and gently worked the color into the letter with my fingers. I wanted to create a halo effect around the letter. Then, using a little water and my fingers, I rubbed Red Cherry along the side edges of the letter. Using CHF Large Dots Backgrounder, I inked it with Gold Metallic and spritzed it lightly with water. Since I wanted a distressed effect, I randomly stamped the image all over the letter, adding more Gold Metallic and water to the stamp as needed. Using watercolor paper, I scribbled Cotton Candy, Guava, Gold Metallic and Lavendar randomly on the paper. Then, using a paintbrush and water, I colored the entire piece of paper. I heat set the paper to help the drying process, then I repainted the paper again to get a layered effect. I created the flower doily by stamping the large floral image from Ornamental Beauty twice onto the paper I just created using black ink. I then embossed the images with Pearl embossing powder to get a subtle gray color. I also stamped the interior circular image from the same set using black ink and then embossed it with Pearl embossing powder. 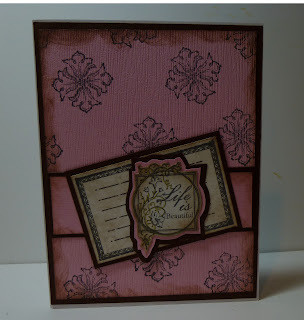 I then added some Gold Metallic and Guava around the edges of the 3 stamped images. Using the stamp in the Red Gelatos set, I colored it with the Faber Castell black marker, fussy cut the flower, then added some Cotton Candy and Guava to the cut out image. I then placed all layers together and added a brad through the center before adhering them to the wood letter with Scraperfect's the Best Glue Ever. To finish my letter, I die cut LOVE from black and pink cardstock using my Cricut Expression. I adhered them to the left side, then added some Want2Scrap Rhinestone Swirls on the right side. I have been having so much fun with Faber Castell's Gelatos. They are so much fun to work with and when used with Cornish Heritage Farm stamps, you can create some amazing projects. The Trees Backgrounder stamp from CHF makes a great generic card. I wanted to create a sunrise background for my stamp, so I colored white cardstock with Buttercream, Lemon and Tangerine Gelatos from the Yellow collection, plus Guava and Lavender Gelatos from the Red collection. Each Gelato set comes with a paint brush, so I used a little water and created a fun background. You can let the paper air dry, or you can heat set it if you want to work on it right away. Once it was dry, I stamped the Trees Backgrounder stamp on top using Clearsnap Candied Yam Chalk Ink. I stamped the sentiment from A Time to Stamp set with the same Candied Yam Chalk Ink, then added some Lemon Gelato over the stamped sentiment. This is one of my new posts on the Classy Cards blog. 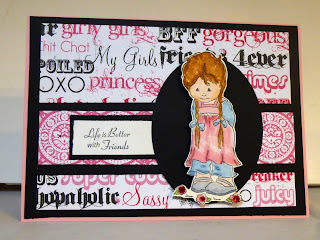 This awesome With Sympathy stamp set is from Justrite Stampers. It has 12 different phrases, several small images, a frame and this lovely rose. So, even though the stamp set is perfect for creating Sympathy cards and projects, there are so many other options available to you. I chose to use the rose as a focal image and created a generic card that would easily be used for Valentine's Day, Mother's Day or even a birthday. I used the Printery collection pad from Prima, selecting 4 different papers and using elements from each one, cutting and tearing for dimension. The sentiment was also cut from one of the papers in this collection and added to the card front with Joy Foam Adhesives. Once colored, I added a little glitter to the interior of the rose using Gelly Roll Stardust Pen. This pen adds just the right amount of shimmer and shine and dries very quickly. A new card for Cornish Heritage Farms. Why not use the stamps to create your own background paper? It's easy and fun too. All the elements I used for this card are from the Ornamental Beauty stamp set. This stamp set contains about 20 different stamps that can be used for any occasion. I created my own paper by stamping one of the images randomly on cardstock. After cutting it to fit the front of my card, I inked the edges of the paper. After stamping the elements I chose for this card, I inked the edges and matted them with cardstock to highlight the stamped images. For the focal point, I used a glitter pen to highlight the flourishes. 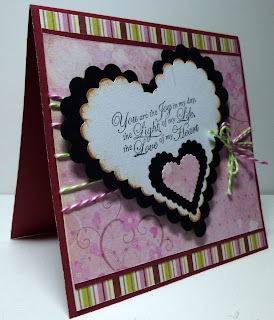 Hi everyone, hope you will all join in on the Love Fest challenges at Splitcoaststampers. Cut cardstock 8 1/2" x 10"
Score at 5" and 9", then turn your paper and score at 2", 2 1/8", 6", 6 1/8"
Thanks for stopping by today. Don't forget to check out the LoveFest at Splitcoaststampers. I always seem to need Thank You cards, and since I had some lovely papers from Webster's Pages, this card came together quite easily. Each double sided paper is so very pretty. I chose the subtle green print as the card's base which I inked and matted with brown cardstock before adhering to the card. 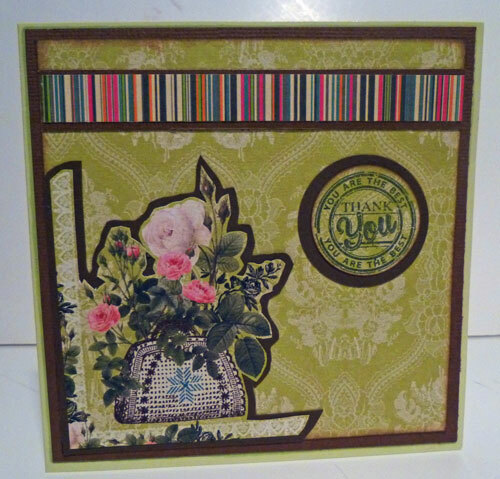 I then cut around the floral image of another paper because I wanted it to be the focal point of the card. After cutting it out, I also matted it with brown cardstock, then adhered it to the lower left side of the card. Using a left over strip of striped paper from Webster's Pages, I matted it with brown cardstock and placed it towards the top of the card because this area needed something more. The sentiment is from Justrite Stampers Spring Words which I stamped with Clearsnap Ink on a left over scrap of paper from Webster's Pages, then matted it with brown cardstock before it adhering to the card. 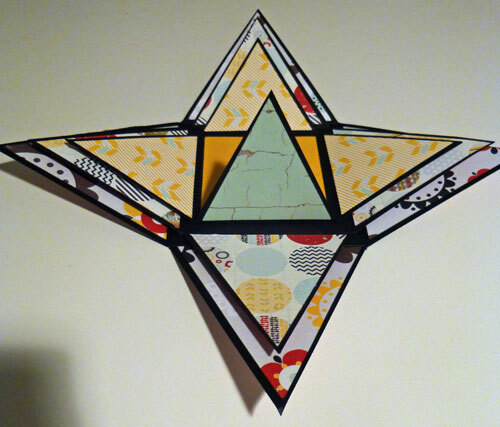 Here's a little snippet of my project appearing on the Scor-pal blog today. 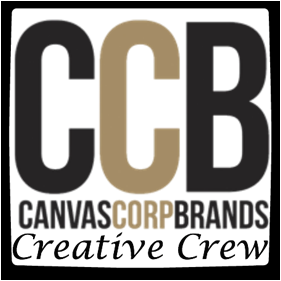 Hope you'll stop by and check it out. I used the smaller cross in the Cross Charms set, covering it with Poodle Skirt Enamel Powder. The bezel is from the Heart Charms set and I coated it with Enchanted Aubergine Enamel Powder several times. I then applied the heart to the bezel with Glastique Finishing Glaze. It works great as an adhesive too. I applied several coats of Glastique and you can see the wonderful shine it gives this piece. I added several pearls to the center of the cross, then tied ribbons to the bezel. I used this piece as the focal point of my card, adding it to die cut ovals with foam adhesives for additional dimension. I have 2 cards up on the Zig Kuretake blog today. 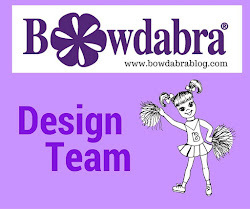 Pop over to the Zig blog and see what the designers have been creating. to pristine in no time at all. You have to try this - check out the Scraperfect blog to see how! It's another challenge at Cornish Heritage Farms and Anne has asked us to create a Valentine's theme. Don't forget Valentine's Day is Thursday. 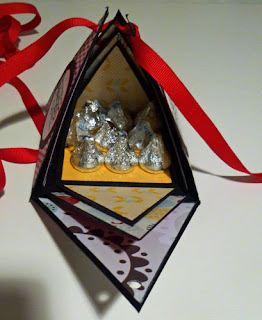 I created a heart shaped card using Spellbinders Scalloped Heart dies and ivory cardstock. Then I cut another heart from red cardstock. 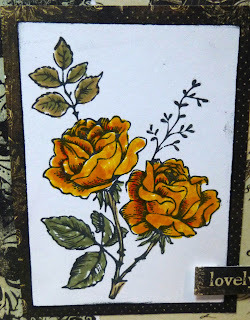 I used the large flower stamp in the Ornamental Beauty stamp set to create the background by stamping it repeatedly in black ink on white cardstock, then I die cut it into a heart shape. I added several more hearts on top. The sentiment is from Script Essential Expressions which consists of 56 different sentiments and phrases. A few pearls finished the card. Thanks for stopping by today and don't forget to see what everyone has created today. It's Thomas Kinkade week at Cornish Heritage Farms. This is the week we all show off what we have done with these wonderful stamps. 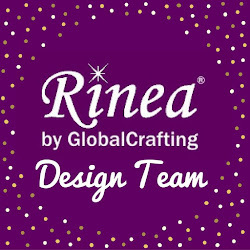 I chose to work with the Light of Peace stamp which is another incredibly detailed Thomas Kinkade stamp. I stamped the image with Color Box's Guacamole Chalk Ink as I've discovered that this is the best ink to showcase the amazing details. Unfortunately, when I picked up the stamped image, I smudged it!!! I was extremely annoyed at myself until I looked a little closer and realized that it gave the image a very reflective look. 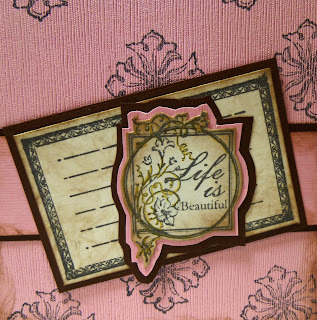 Of course, then I had to add the sentiment from A Time to Reflect stamp set. It's another challenge at Justrite Stampers and since I recently got these stamps in the mail, I just had to play with them. The rose is from the With Sympathy stamp set. This set is fast becoming one of my favorites because it has a lot of possibilities. Although it is a Sympathy set, it can also be used for a generic Thinking of You card, a Valentine's or Love card, or just use the individual elements and create any type of card you need. I colored the roses with Zig markers, adding a little Wink of Stella to the tips for a little shimmer. Because I wanted the roses to stand out, I cut around the image. I used the Nested Oval Medallion Dies to hold my images, stamping a background for my roses with one of the elements from the Botannical Medallions and Banners stamp set. As I didn't want any other papers to compete with my stamped images, I embossed the white background paper with a Cuttlebug embossing folder. I wrapped some sheer ribbon around the card then added the image with foam adhesives. This is my post today at the Rubber Buggy. Using a Bild Malarma stamp, I colored her with an assortment of Copic Markers after first stamping her on Copic Xpress It Blending Cardstock. As I wanted her to be the focal point, I fussy cut her and mounted her on a black cardstock oval which I die cut with a Spellbinders die. Before placing her on the card, I added foam adhesives for some dimension. Good morning, it's Steph again with a tutorial on creating a card that would be wonderful for a wedding card or even a Valentine's Day card. It's posted on the Classy Cards Blog. 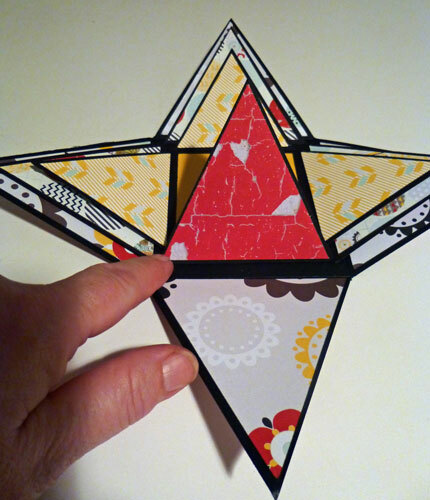 Create a 5 1/2" x 5 1/2" square card from red cardstock, scoring it perfectly with the Scor-Buddy. 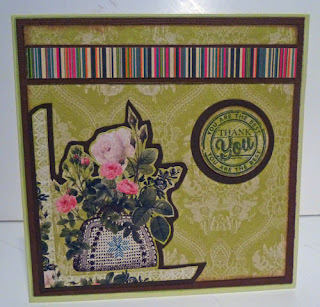 Using papers from Trimcraft's Love Letters paper pad, cut papers 5" x 5" and create a layered effect by using the striped paper as the base layer. Add a strip of red cardstock the top and bottom edges of the heart layer. Using Doodle Twine in pink and lime, wrap it around the heart paper three times. Tie a bow on the right side and spread the twine apart. Add to the card base. Die cut all the hearts using the Spellbinders Classic Scalloped Hearts. Die cut a large heart from black cardstock. Die cut a smaller heart from white cardstock. Die cut a small heart from black cardstock. Die cut a small pink heart from the heart paper. Stamp a sentiment from Justrite Stampers Wedding Nested Sentiments on the white heart. Sponge Spun Sugar Distress Ink around the edges of the white heart, then layer it on the larger black heart. Add the 2 smaller hearts to the bottom of the heart to fill in the empty space and to add some visual interest. 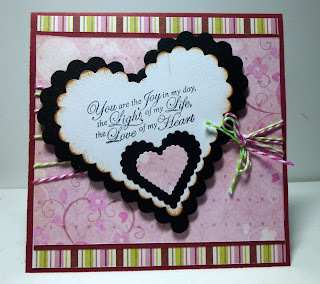 Adhere the heart to the card using Joy Foam Adhesives for dimension. 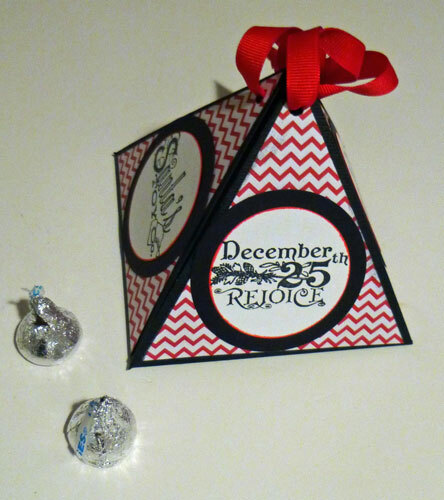 This is a project using my Scor-pal, 3 pieces of cardstock and assorted pattern papers from Fancy Pants Designs. 1 piece of cardstock is 12" x 12" - score at 4" and 8", turning the paper and scoring again 4" and 8", creating 9 equal sized squares. 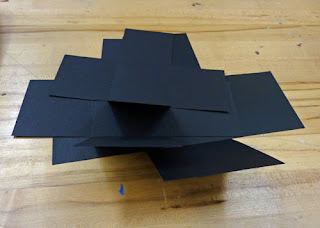 Cut 1 piece of cardstock 10 1/4" x 10 1/4" and score at 3 1/2" and 6 1/2", turning the paper and scoring again at 3 1/2" and 6 1/2", creating 9 equal sized squares. 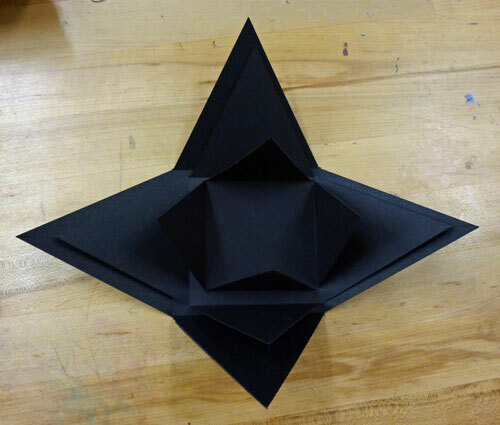 Cut 1 piece of cardstock 8 1/2" x 8 1/2" and score at 2 3/4" and 5 3/4", turning the paper and scoring again at 2 3/4" and 5 3/4, creating 9 equal sized squares. Cut along the score lines and remove the corner pieces. 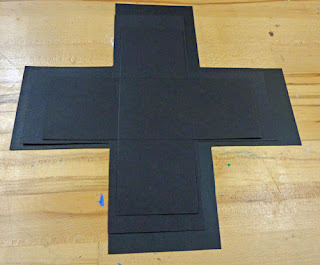 Your three pieces of cardstock should look like a "t"
Fold each piece along the scored lines. To form the triangle, cut each piece on the diagonal. Find the center of each edge and cut to the score lines. Add Scor-Tape to the center of each piece and assemble together to form one unit. Using assorted papers from Fancy Pants Designs - The Good Life Collection - cut pattern paper to fit each triangle. Layer 1 - cut 8 pieces, each 3 3/4" x 3 3/4". Layer 2 - cut 8 pieces, each 3 1/4" x 3 1/4". Layer 3 - cut 8 pieces, each 2 3/4" x 2 3/4". 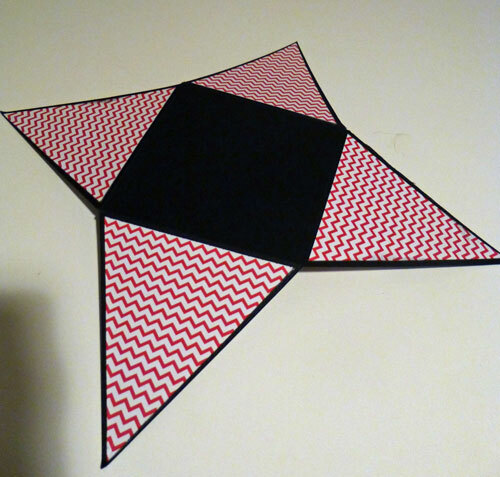 To finish the inside, add a 2 3/4" x 2 3/4" square to the base. Decorate as desired. I added stamps around my box. Punch holes in the tops of each point and thread ribbon through the holes. Fill the box with candy or other little treats and pull the ribbon together to close. 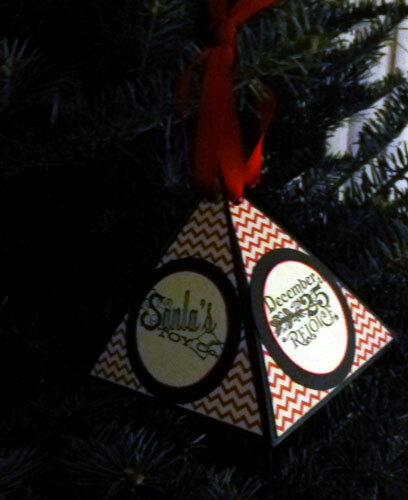 This is the perfect item to put in the Christmas tree since it doesn't weigh very much, or even use as a place setting on the dining room table.